Toni and i decided to do a little impromptu trip to the mountains for the weekend. The goal wasn't photography, but since we were there, might as well bring the camera right? Well, we brought the camera and hoped for the best. The clouds were excellent all the way up to the mountains, but as we got past Wilkesboro, the clouds got thicker and the rain started to fall. We decided to hop on the Blue Ridge Parkway to see if the rain would subside long enough to get some pictures. Once we entered, we were greeted by some pretty dense fog which I didn't mind at all. The colors looked nice, and I was pretty hopeful for what I would be able to capture. As I got into the mindset of looking for foggy compositions, the fog broke. Now it was starting to mist, which was not too big of a deal. 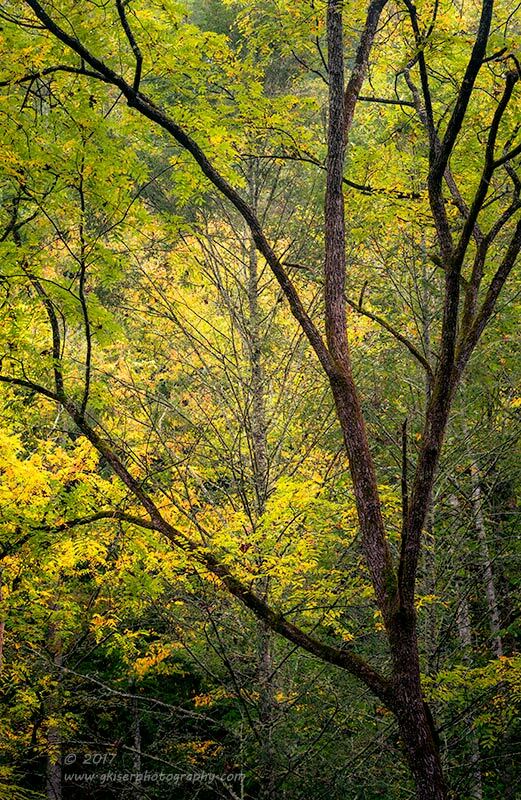 I changed gears and looked for some woodland isolations that I could shoot that would show the color. As I started to get into tune with that type of composition, the rain got harder. Well, I can't work in that kind of rain, so I turned around. We entered fog again along with the rain, and then the fog started to lift, and the rain slacked off a little bit. We happened to be coming around a curve and there was a really nice red tree framed by a fence that caught both of our eyes. I went ahead and pulled the 4Runner off to the side of the road and looked at the scene closer. Toni was dead set that she wanted the fence to be the main leading line into the tree, and I could see that composition working nicely. I had a bit of curiosity about using the road itself as an "S curve" through the scene though. I crossed the road (the answer to Why did the photographer cross the road?) to check things out. I could see a good bit of potential here, and decided to get the camera. The mist was getting heavier so I knew that I was going to need to get my long lens because it has the deepest hood to shield the lens. This hood that was so necessary to the protection of the lens prevented me from using any filters. The bit of glare that a polarizer would have removed wasn't worth fighting the water on the lens, so I wasn't stressing it. I got everything set up and found my position. I actually shot this scene at 135mm which was actually pretty narrow for a landscape shot, but it captured everything that I wanted in the shot. I played with the composition a little bit, and managed to fire off three shots before the rain started to fall in earnest once again. It was too much for me to subject the camera to since I didn't have my foul weather gear out and ready. I went ahead and packed everything back up and got back in the truck. I was looking for some more compositions, but the weather just wasn't going to work out. I decided to wait until tomorrow. Well, tomorrow came and while the sky was phenomenal, and the lighting was perfect, I just wasn't really motivated to shoot any more. I had other things that needed to be done back at home, and I just wasn't feeling creative at all. Instead of fighting it and trying to make photographs, we just headed home and called it a day. Sometimes, the artists just isn't ready to create. That is part of it, and I would have liked to have captured some of the scenes that were going around in my head, but the images would have looked forced, and I wouldn't have been happy with them. As it turned out though, one of the three that I shot on Saturday actually turned out quite well. For not going out there to make photographs, coming home with one picture is a resounding success! So, every so often I put feelers out through social media about wanting to photograph old cars and barns. My friends all know that I enjoy photographing these things. I ask then, how is it that one of my friends out of nowhere one day starts talking about a Nova sitting in her back yard. 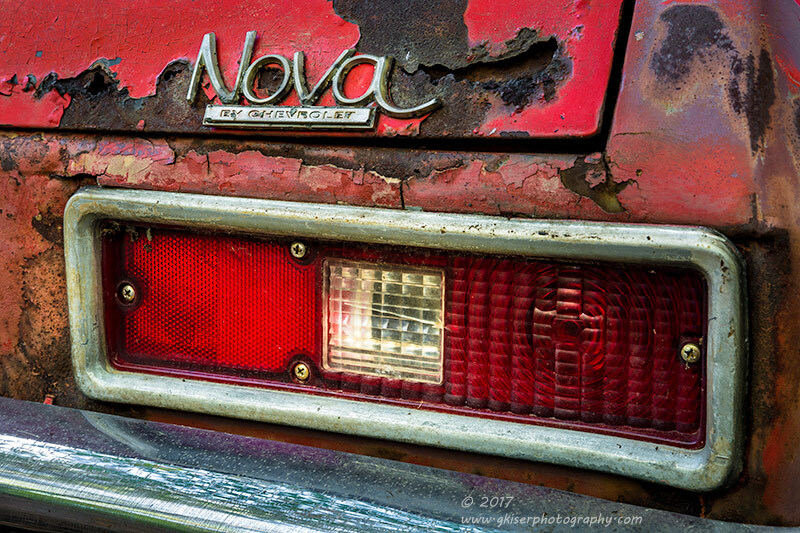 Wait.....a Nova you say? A '72 you say? How have I not heard about this until now? Well, it's better late than never I suppose. She sent me some pictures of the car as it sat under a car cover. It was hard to tell the actual condition of the car, but I could see that there was very little rust on it. But, I had not shot a Nova before, and they are one of my favorite body styles from the 70's. it was worth a shot...pardon the pun. Looking at the pictures, I could tell where the sun would be hitting, and I was pretty sure that I would need some nice diffused lighting to make the exposures look right. The trees let the sky through, so an overcast day would probably not work as well with the bright white shining through the trees. I was going to need a blue sky day with clouds over the sun, or a dark gray day to make it work out. My first opportunity came the night of severe storms. The sky was great, but the wind was relentless and it was raining. The next day promised decent cloud cover, and a possibility for a shoot. As the afternoon neared, the sky was much clearer than the forecast had lead me to believe. I wasn't sure if it was going to work, but I figured that since I had worked through lunch and could leave a little early, I would give it a try. If nothing else, I could scout it out and see what was there to work with. When I arrived, the trees were doing a decent job of blocking the direct light, so that was good. There was plenty of blue sky behind the trees as well so that was in my favor. I went over and pulled the cover off and looked at the car. It wasn't nearly as rusty as I was hoping. Shoot, it was actually in pretty good condition. The car itself though, was worth photographing and the lighting was looking pretty good for the time being. I went ahead and pulled out my camera and mounted the 24-70mm lens since I was going to have to get in close due to some obstacles in the yard. I started to size up compositions and wasn't all that impressed due to an out building to the rear of the car. It wasn't horrible, but it made the pictures look like a basic snapshot, and I wasn't looking for that type of photograph. I started to get in closer to the details and found that there were some wonderful lines in this car. That was what I zeroed in on for the pictures. 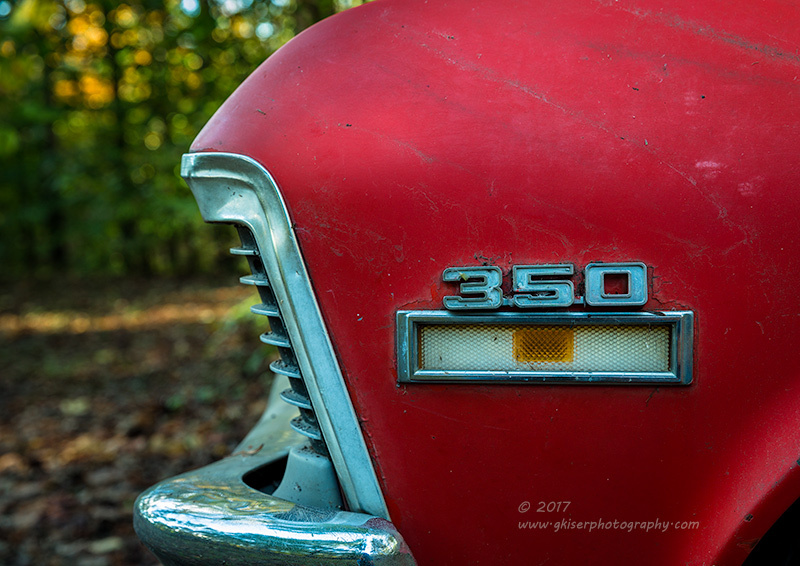 Of course, I started out with the emblems as those are some of my favorite things to photograph on these older cars. There wasn't quite as much flare to the '70's though, and I was left really wanting more out of the emblems. I guess I have been spoiled by the '40's and 50's emblems recently. At any rate, I was able to get in close and capture some compositions that made sense and caught the soul of the car. 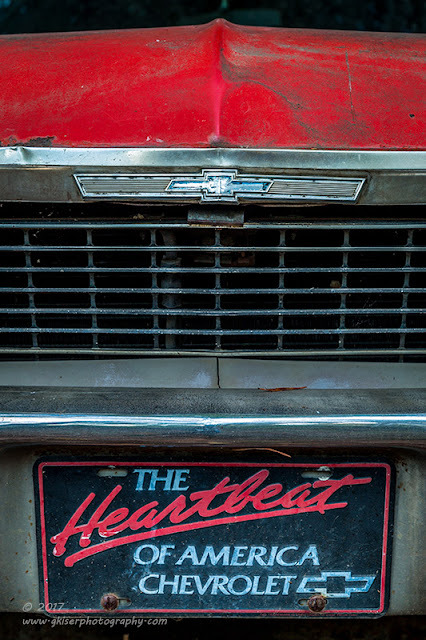 Of course, the vintage "Heartbeat" tag on the front captured my eye, and the fact that the script matched the color of the car was an added bonus. It proved a nice balance to the image. 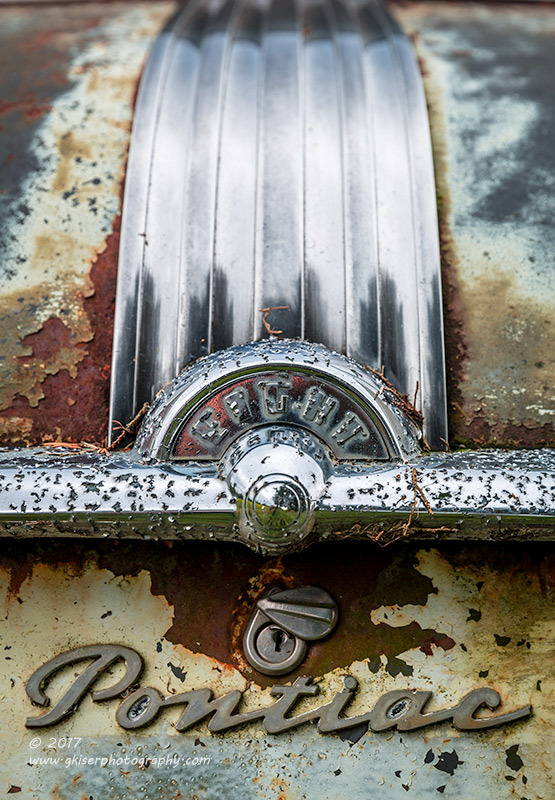 Just because the car was in generally good condition doesn't mean that it was devoid of rust. There was some decent body rot on the car that captured my attention. Fortunately, there was a good deal of it near the rear name plate and tail light. Of course, this captured my attention and I went to work figuring out a composition that included these elements as they all work together to tell a story. 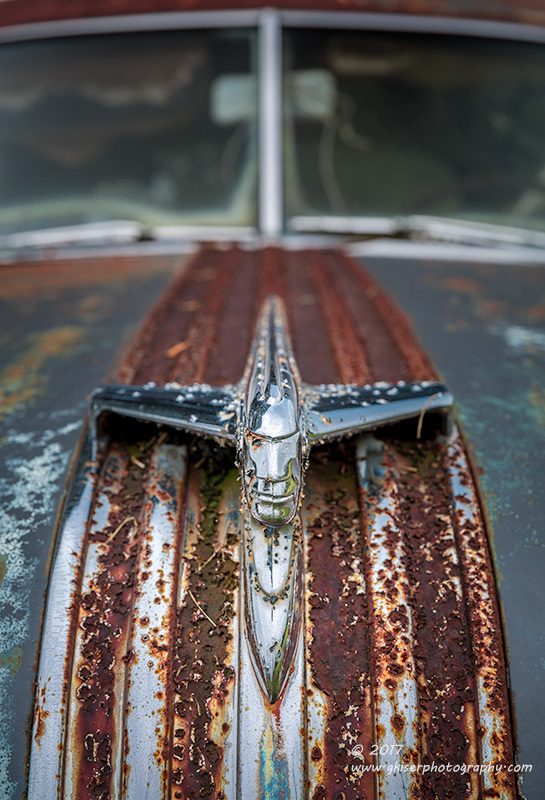 From a rust hunter's standpoint, this composition was the money shot for this old car. 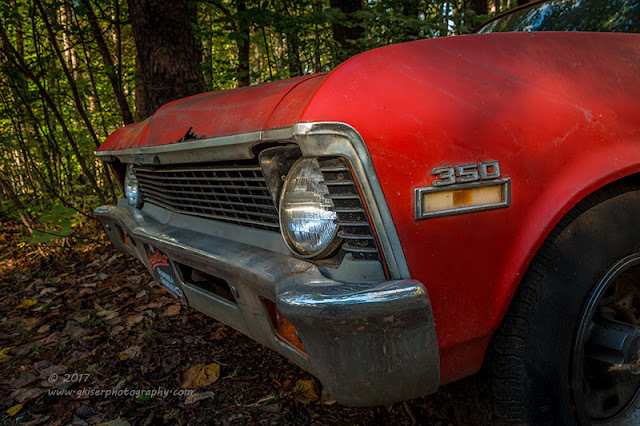 One of the features of these old Novas that I really like was one that was shared with the late '60's Chevelles. That is the continuation of the grill to the edge of the fender. The fins are an iconic part of this design and were captured beautifully from the side. To make for a complete composition, I was very happy to see that the displacement badge and the marker light were still intact on the fender. They really helped to break up the sea of red. 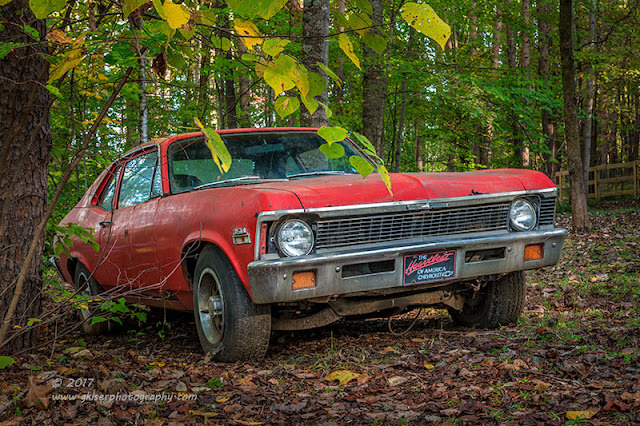 Fortunately, I had some nice green tones in the woods just beyond to balance out the very warm tones of the fender. For a car nut, there are just enough clues here to determine what car you are looking at, but you do have to take it all in before you figure it out. 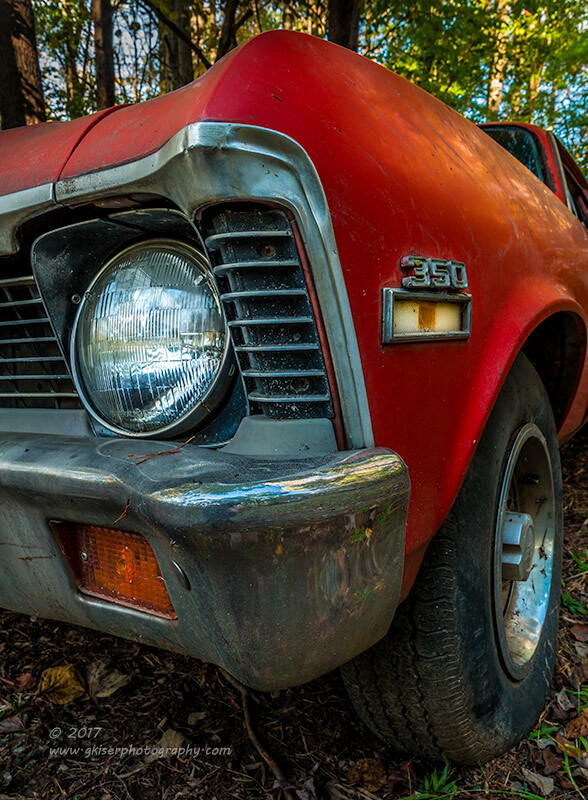 For those that aren't car nuts, there are lots of angles that add to the excitement of the image to draw you in. The depth is provided by the limited depth of field causing a blur to the background. Speaking of that iconic grill, I had to get a composition with the whole front end represented. Since the sun was starting to give me some mottled lighting on the fender, I used that to help highlight the 350 badge and the headlight. 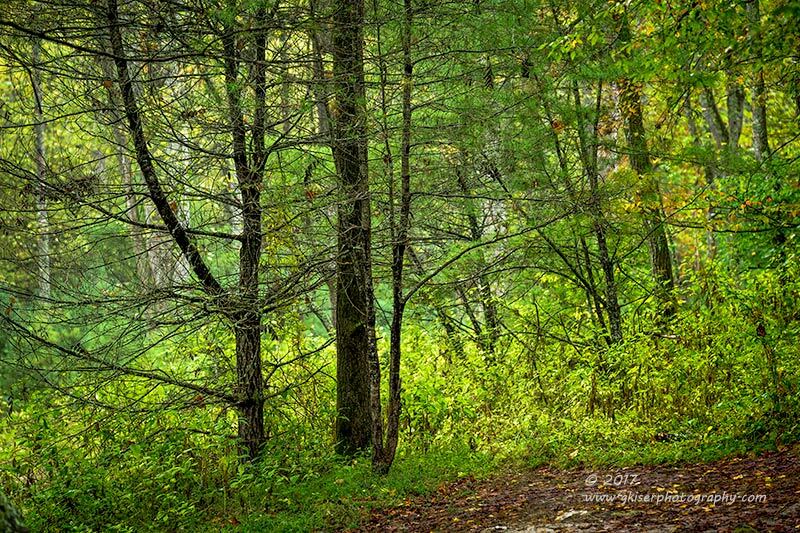 The woods once again provided a nice color balance to the image and kept the red from being overly prominent. There is more there than I would have typically liked, but I think overall, the color balance works just fine. I spent about an hour working the car, and in that hour, I got 37 frames shot. There are many compositions that I don't have represented here because they were just too mundane and boring. many included the outbuilding which I didn't think was too bad at the time, but looking at the pictures on the monitor, it was a very big distraction. It was the close up shots that really made this photo shoot. I was actually quite surprised to have ended up with six different pictures that I really liked from this car. Not too bad for an hour's work. OK, to be honest, I didn't really expect much from this trip. The weather was not looking great either day with very little cloud cover. 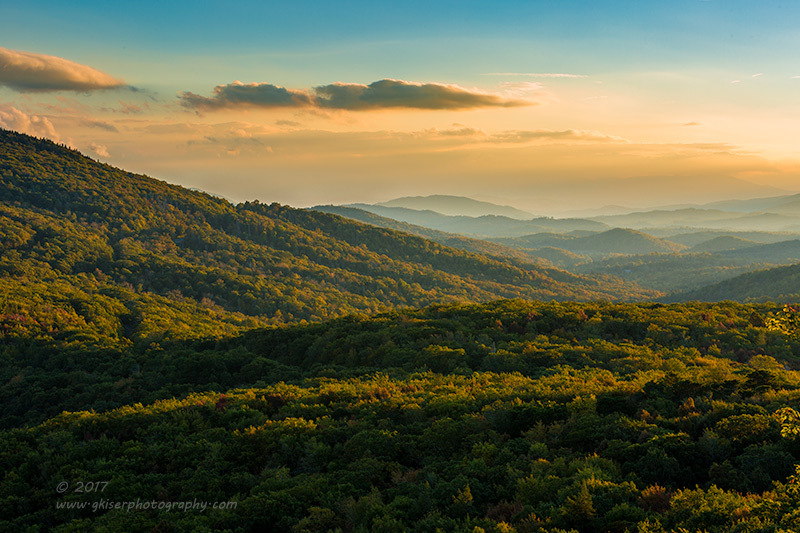 It became more a matter of trying to get that last bit of fall color in the mountains before it was all gone. If I found the right trees, I could handle a blank sky, and that set the mission for the day. I got up early and left just before Toni headed to Doughton Park. My plan was to try and shoot some stars as dawn was breaking, and the best place to do that is Doughton. When I arrived, the sky was mostly clear as expected, and I started the chilly hike up the Bluff Mountain Trail. To my surprise, I found not one, but two tents set up right where I wanted to put the tripod. Well, that wasn't expected at all. I wasn't going to be able to get the stars as I had wanted to, and that was ok. The more I looked up, the more haze I saw in the sky and it wasn't quite as clear as I wanted it. On the other hand, there wasn't any actual clouds either. That meant that sunrise would be rather dull. Fortunately, I had another idea and that was possibly going to work out. 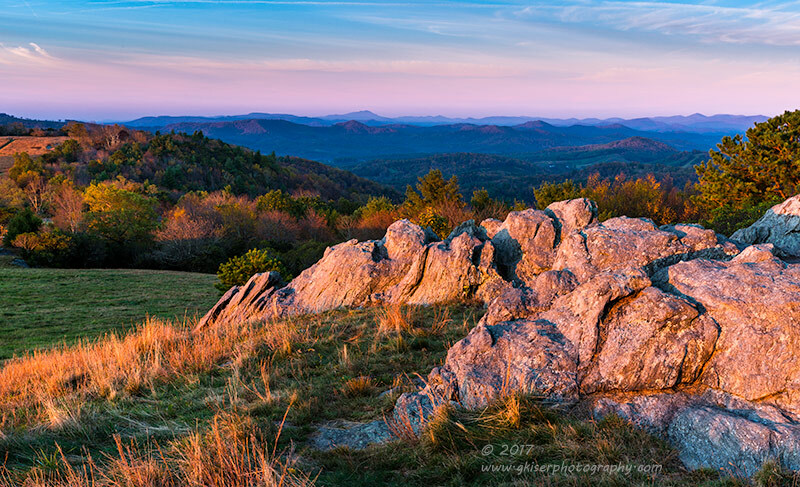 A while Back I shot to the West on a clear morning at sunrise and got some nice Alpenglow from atop this hill. I was going to give that a try. I was wanting to use my long lens, but the tents were in the way for that, so I opted for my 24-70mm lens and got in a little closer. The mountains in the distance didn't suffer too much from the shorter focal length so I was good. I set up my composition and waited for the light to happen. My ultimate goal was to get the warm sunlight on the rocks, but I was enjoying watching the shadow of the Earth moving toward the horizon. When it entered into my frame, I started making exposures. The light clouds above did a fantastic job of capturing the pink sunlight and gave some nice texture to the sky. The exposure was even enough that I didn't need any filters either. There was plenty of detail in the foreground and the distant mountains were very rich in their visual detail as well. With the haze in the sky, I was wondering if I was going to get my sunlight on the rocks as I had envisioned. It was a painfully slow process watching the sun come up behind my back. The further up it got, the less interesting the sky became. I was getting worried, and it was a race with only one element controlling two aspects of the composition. As the sun got closer to the rocks, the blue was returning to the sky, just above the pink. This could work out if the timing hit just right. It actually did for a change. The rocks became red with the low sun, and the blue sky came right into my frame at the top. I fired off a few frames and saw that the exposure was well inside of the camera's capabilities so I called it quits on that location in favor of moving to another place. While I had been shooting the occupants of the tents had woken up and were all out enjoying the sunrise. I didn't want to intrude further. I worked my way down the hill to a fallen tree that I have shot many times before. It was still looking really nice, but the sky wasn't really working on any level for a picture. I continued on to the parking lot and was about to load up the 4Runner when I looked over on the other side of the parking lot. The Bluff Mountain Trail was really standing out in the low sun, and there was a small tree that looked like a great visual anchor. I decided to give it a shot or two. I swapped in my 70-200mm lens because I needed the elevation from the parking lot to get the composition I wanted. That meant that I needed a lot more reach than my other lens could deliver. I started framing up compositions and trying them out. The sky was horrible, and ultimately I decided to omit it from the composition. I focused on the trail and the tree more than anything else. The contrast appeared to be great with the low sun, and since the colors were all about the same, the textures were what really made this image. It also has a certain dreamy quality to it. With that composition done, I started to work on a panorama, but I really didn't like how it was coming together. By the time I got home and stitched the seven shots I found very little interest in it. I ended up trashing it along with nearly 60 frames from the morning. I drove back the long way through Wilkesboro in hopes of finding a barn or old car to work with, but the light was just too harsh for anything else. I went ahead and pointed towards home and got home hours before I intended. 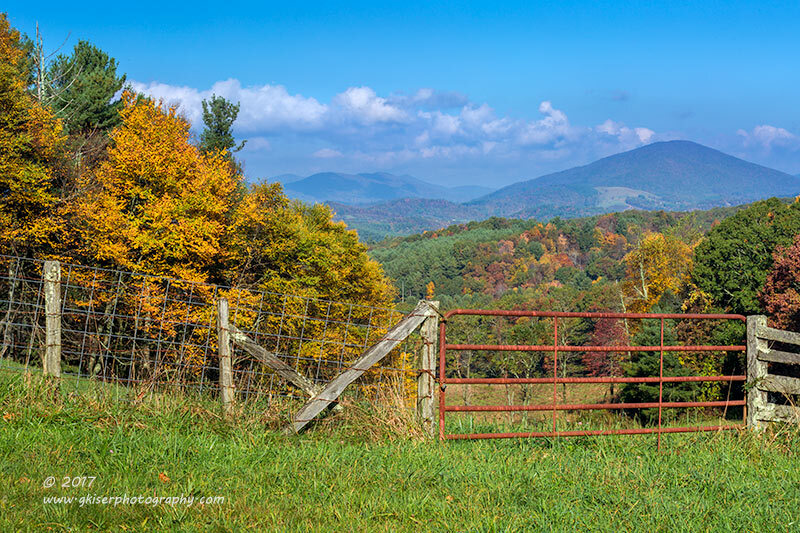 Looking through the images from the day, I was less than happy with the final outcome, but I was happy to have been to the mountains and tried once again to find some more fall color. This fall season had started out so well, but ended so weak. The temperatures were just too high, and we had gone through a very dry period at the crucial time for the change of colors. I'm hoping to have another chance to get some fall color here at home in the next week or so, but I'm afraid that the trend started in the mountains will continue here as well. At least I really like winter photography. LOL! 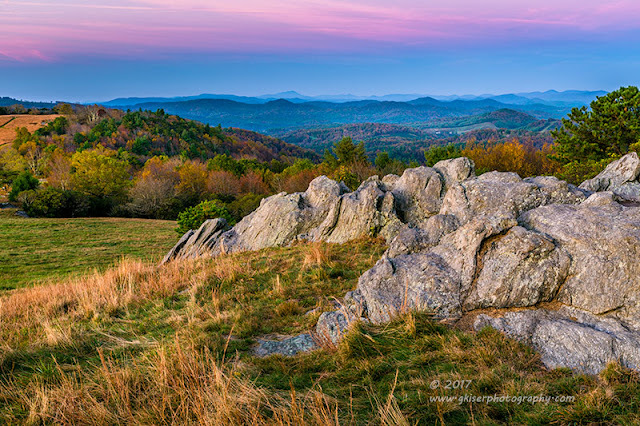 So the story goes...My day job caused me to miss most of the peak color along the Blue Ridge Parkway thanks to a 12 day work week that concluded yesterday. While I was able to sneak away for a short Trek to Stone Mountain, there was not time to really do much on the Parkway unfortunately. I waited patiently until the following weekend when I had an opportunity to go back for another attempt at the Fall Color. Looking at the weather, I was expecting mostly cloudy skies that would start breaking up around mid day. That could prove interesting, so I was all in for spending the morning in the mountains. I started my day at a little after 4am and checked the weather. There was no fog until about 11am, so that was even better! I was excited to work with the fog and what was left of the color up there. In about an hour, I was on the road headed West. There was plenty of clouds in the sky here at home, and I had no doubt that there would be clouds in the mountains as well. 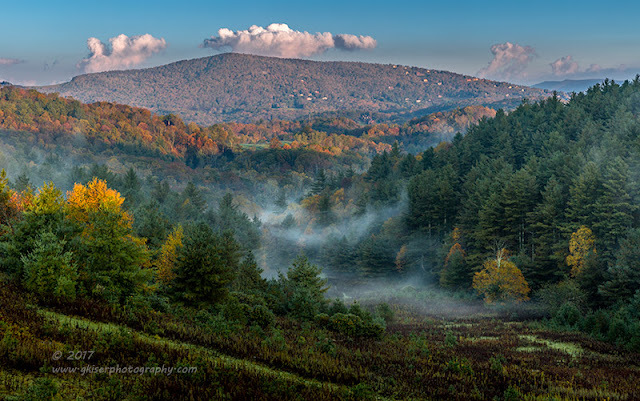 As I was climbing up the ascent after Wilkesboro, I started to wonder where the fog was. I was passing through some patches, but nothing substantial at all. By the time I hit the Parkway, visibility was perfectly clear and I could actually see stars. That was a twist I wasn't expecting. The first overlook I drove past I pulled into to see what things were looking like. There was a sea of clouds below which was a nice surprise. The sky was starting to show some color, so I decided to head over to the Grand View overlook to see what that looked like. When I arrived, there were already two cars there, and I made it three. I got out of the 4Runner and nearly froze since I was wearing shorts and it was in the mid 50's. But the scene was unfolding quite nicely so I pulled the camera out and fitted my 24-70mm lens so I could capture the entire scene. I went ahead and added the Lee Filter holder and a 3-Stop Hard edge ND Grad filter to control the sky. I found a spot that gave me the most clear view and got the composition set up. The exposures were around 30 seconds at f/8 since it was still quite dark. But I knew that a long exposure in the dark would yield some pretty terrific colors if I was reading the sky right. As the camera was soaking in the scene, I noticed that there was another photographer with a tripod set up, but no camera. He was sitting in the car waiting on different light. The camera finished the exposure and I saw the LCD. Right then, I knew that he was missing out. 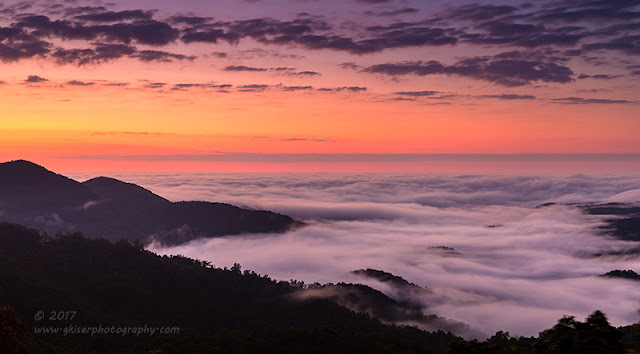 With the lack of clouds above, there would not be much other color as the sun continued to rise, and the low clouds would eventually be overexposed in the sunlight. Oh well, I was capturing the images that I was wanting and that was what mattered. As the sun rose, I noticed that the sky was fading into a blank canvas with no color at all. The other photographer was out of the car at this point and setting up the camera. 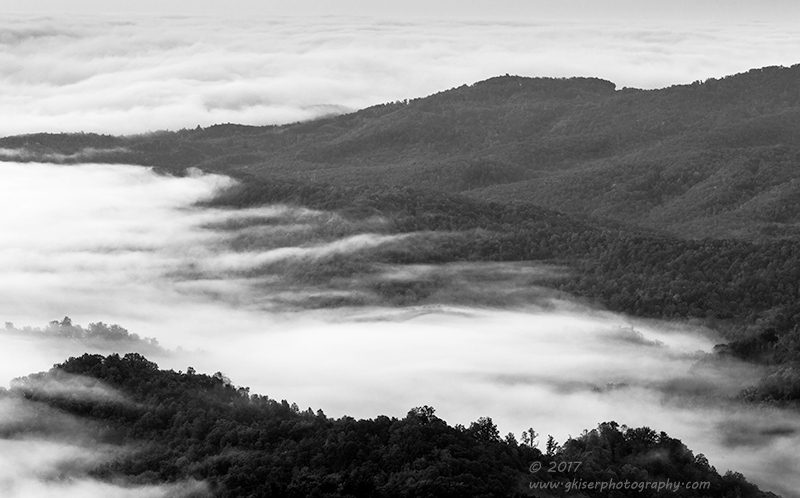 He said something to the effect, of "come on sun," as I was setting up for a series of black and white shots to capture the fog in the valley without the need for the sky at all. For this group, I swapped to my 70-200mm lens and kept my filters in the bag. I was able to pick out areas of the mountains that particularly interested me. The exposures were all pretty simple as the sun was not up yet. There is just something magical about the low clouds rolling up to the mountains. It is a sight that has always haunted me. There was very little color to see due to the fog and the lighting so each and every frame that I shot looked like a monochrome image in the LCD review. That was fine by me since I was shooting them to be black and white. The contrast and textures were more important to me at this point than the colors. When I got home and started to convert them, the photographs stayed true to how I actually saw them. That is...except for one of them. One of the compositions that I shot had just a hint of color in the foreground mountain. It wasn't much, but there was enough to convince me to leave it as a color image instead of converting it. There was still very much of a monochrome feel, but the visual weight of the foreground really increased with the addition of the color present. As a very happy side note, Toni is excited about this one, and is wanting to pastel it. I'm looking forward to seeing her interpretation of this scene. Doing these shots kind of set the tone for the rest of the day as the sky never really got interesting. The real story of the landscape was the low clouds and fog present at many of the locations. With the sky losing my interest, and having shot most of the compositions that jumped out at me, I decided to move on down the road to see what I could find before the sun got too high up in the sky. I loaded up the camera as several other folks were starting to take their pictures. My next stop would be the back side of Thunder Hill. There is a section just down the road that I have shot at sunset before that I wanted to try at sunrise. As I drove past it, I could see fog down in the valley, and just a couple of clouds right above the mountain. This was worth shooting for sure. I went ahead and parked the 4Runner and walked back to the side of the road and started to set the camera up. I opted for the 24-70mm lens with a polarizer attached. The filter didn't do a whole lot due to the angle I was shooting, but it did help with the clouds ever so slightly. I framed up the shot and took several shots with slight variations on the composition. What I was finding though, was that my interest was more in the center of the frame where the fog was. A side benefit was I didn't need to worry about the early morning sky in the background if I were to isolate the foggy areas. I went ahead and put the 70-200mm lens back on and added the polarizer to it. I wanted to be able to get all the contrast that I could as well as any saturation that was available. I started to pick out the interesting sections of the frame with a bit more reach than I had been able to have with my other lens. The composition was not my usual one by any stretch, but I'm really starting to get into the "filling the frame with what you like" concept. I found a nice section of fog that provided a visual path through the trees and surrounded the pine trees that I was really interested in. This composition has a really nice feel to it, and I'm actually quite happy with how it turned out. Mental note to self, experiment more with landscapes! 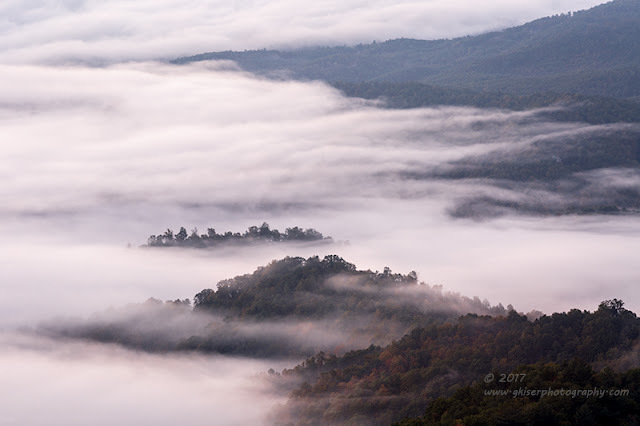 I was really captivated by how the fog was moving around in the valley, and how it would help to isolate certain elements. 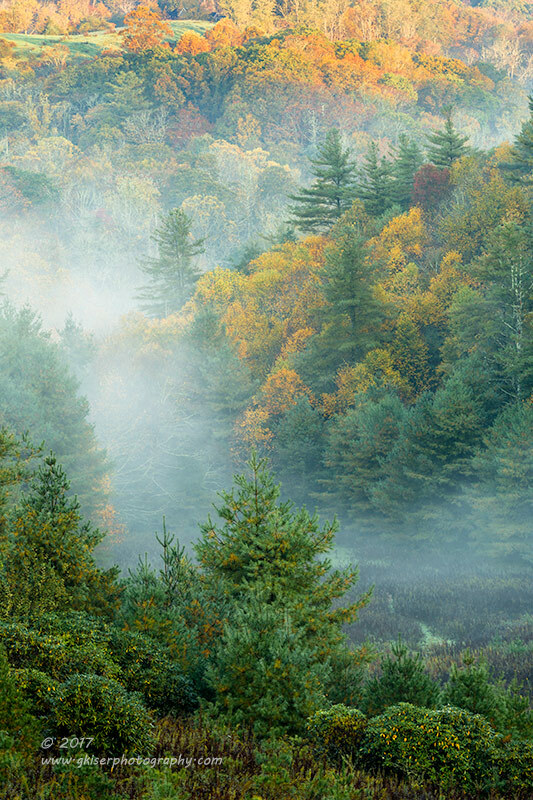 I went ahead and flipped the camera over for a horizontal view and waited until the fog was in a position to isolate the one tree in the foreground, and also the pines just behind the golden trees. it didn't take long for that to happen, and I was shooting once again. The fog made some pretty good depth possible. I played around with the fog for a while until the sunlight was getting too bright, and starting to encroach into the main part of the composition. It was at that point that I decided it was time to pack it in and head back to the truck. Right before I started to take the filter off, I happened to catch a tree well over to the right of the field that had escaped my attention...until now. This was a golden tree set all along with a very interesting trunk structure. It was worth a few frames at least. it was in the shadows, but the fog was rolling past it so there was plenty of visual interest to it. Dealing with this fog was tricky. 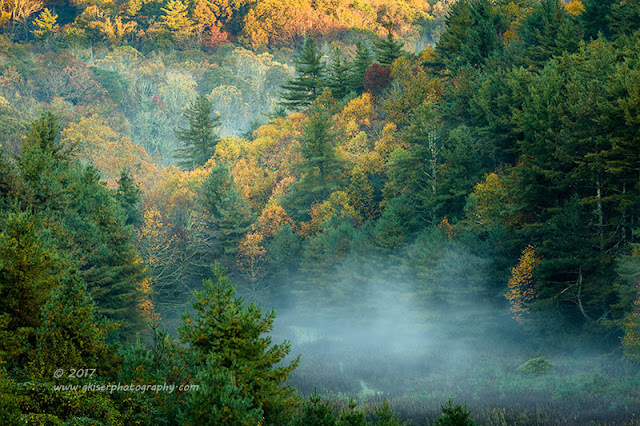 About the time I would get the shot set up, the fog would disappear and the scene would be less than exciting. Other times, the wind would blow it right over my location and obscure the entire thing. I was playing a game of cat and mouse waiting for that perfect moment to snap the shutter. My first composition was set up with two different golden trees opposed to each other. The sizing worked out due to the slight rise that the small one was one. The fog followed the rise of the land so it stayed right with both trees equally. I was really drawn to the symmetrical look of these two very different trees. Even though I liked the two trees together, it was the bigger of the two that really caught my eye. I loved the trunk structure of it, and the color was pretty awesome against the green trees in the background. I flipped the camera over and framed a shot that just included the tree. Now, I try not to center my subjects typically, but this time, I couldn't help myself. This tree called for the post card shot, or the book cover shot depending on who's looking. Once again, I played the waiting game for the fog to roll in just the way I was wanting it to. It seemed like it took forever, but it did finally come in nice and faint at the bottom, as well as just slightly above. 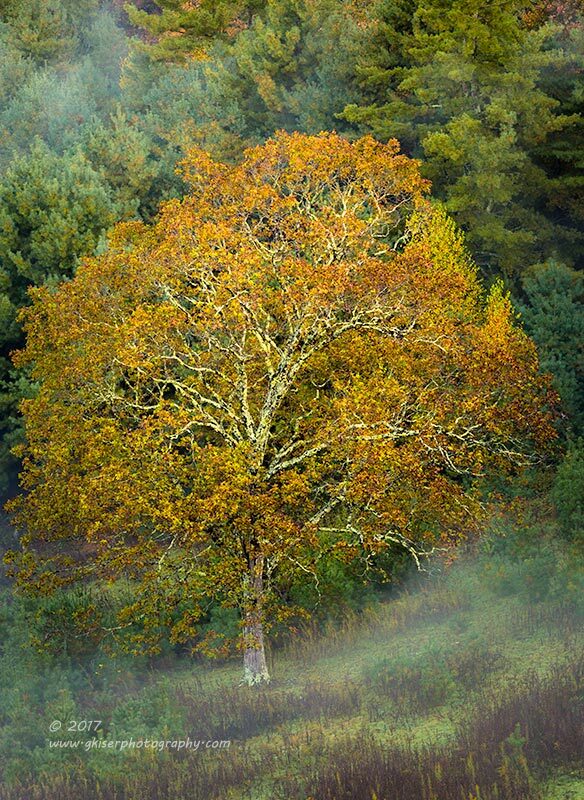 The idea was to have the tree nice and prominent in the shot, and having the fog obscure it just wouldn't do. The shot that made the cut checked all of the boxes and became one of my favorite images from the day. As I was looking at it in detail, the trunk that caught my eye actually provided a compositional plus for me. While I had pretty much centered the tree, the trunk was pleasantly off center to the left providing some much needed visual tension to the piece. Yeah, this one turned out very nice indeed. The sun was still rising behind me, and things were losing their magic in the valley. It was time to pack the camera up and head to the next destination. 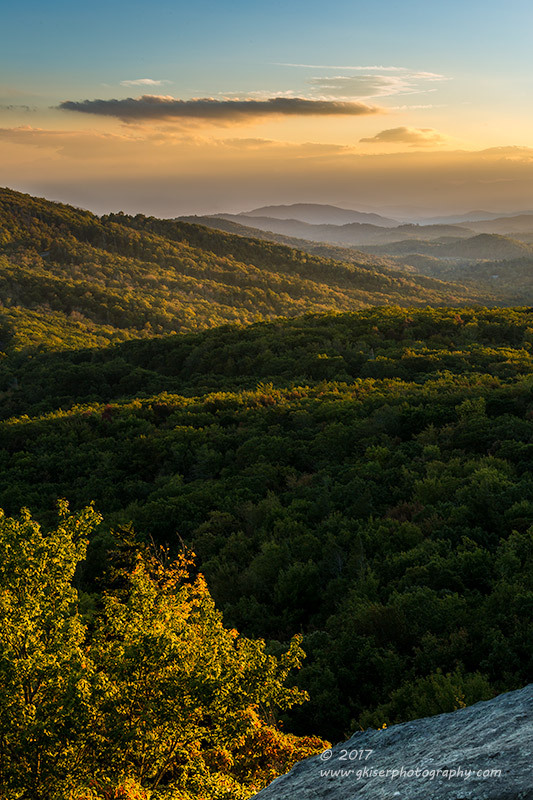 The idea was to go to Rough Ridge as I was hoping that the leaves were still vibrant there. As I got closer, I was starting to see that the trees were mostly bare, and the leaves that were left were mostly brown. I wasn't feeling very lucky at all at this point, and by the time I got to Price Lake, I decided to turn around. My plan was now to go to Doughton Park at a lower altitude to see what I could see. As I passed EB Jeffress Park, the colors started to get a little better than before. 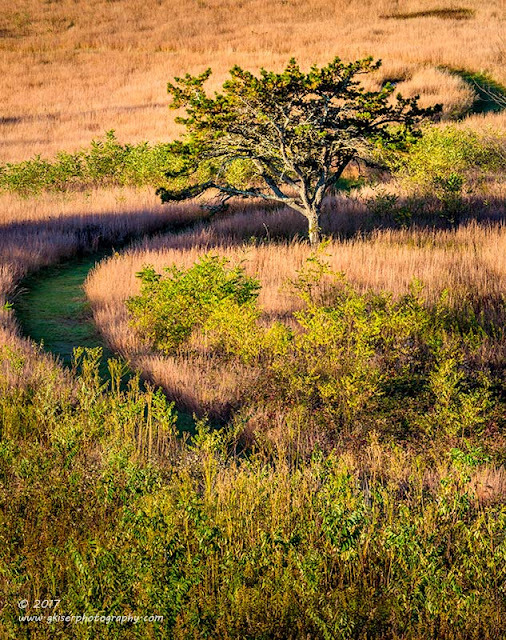 I hit a stretch of the parkway that actually looked pretty vibrant just beyond the main park. I decided to pull over to the side and give the scene a try. Since I was going to capture the road, I opted to use my 24-70mm lens with a Singh Ray Polarizer attached. I started out by composing with the sky in the frame, but really didn't like that composition that much. I closed it up a little bit and eliminated the sky which really strengthened the composition. I had a sea of color that was bound by two pine trees to the right and a rocky wall to the left. The Parkway itself lead the eyes through the frame. I loved the way the colors popped in this shot, and the sun was actually doing me a lot of favors for once. I stayed here for a good little bit trying different things since there was nobody at all on the road here. Considering the typical Fall traffic out here, I was impressed and happy to soak in the quiet for a while. When I finally did leave, I was headed to Doughton Park before heading home. As I neared the halfway mark, I found one of my favorite scenes with a little red gate. The trees looked really good through here so I decided to pull off to the side and get a few shots. Typically, I will use a wider focal length for this scene, but today, I wanted to get more impact from the trees beyond the fence. For that, I decided to keep my 70-200mm lens attached and just add a polarizer. Ironically enough, I actually shot this scene from the other side of the road in order to get the perspective that I achieved here. The benefit was the mountain in the distance remained prominent and the trees in the midground carried a much needed visual weight in the photograph. The gate was not overly big either, so this all worked out well when it came to scale. In fact, this might be a better way of shooting this particular scene when compared with my 24-70mm which I usually use. After I played with this scene for a bit, I realized that the sun was becoming too harsh, and it was getting close to the middle of the day. It was time to call it quits and head home. I hadn't been to Doughton, but I can't imagine that the quality of light would be favorable there because it was diminishing quickly everywhere I looked. I decided to try a different route home and do some exploring so I asked the GPS to pick my route. It took me down Hwy 18 to Wilkesboro. As I was going down the mountain, I found myself driving through the clouds and eventually ended up under them. Now the quality of light was much better than it had been. I started to look for other subjects to photograph before heading home. Unfortunately though, I did need to get home, so I didn't do much exploring, just kept working my way East on some of the state roads instead of hopping on 421. I saw a bunch of things that had promise, but just didn't jump out at me. I will be back to this area when my mind is set on doing barns this winter. I finally did make it back to 421 and to familiar territory. The sky was looking really good at this point and I was really wanting to shoot something else. After having looked at all of the barns, I was starting to get in the mood to shoot something rustic. I knew that I wasn't going to pass anything that would fit that bill at this point since I have been up and down this road for years. I was needing to get home, so I was torn about whether or not to go exploring some more. 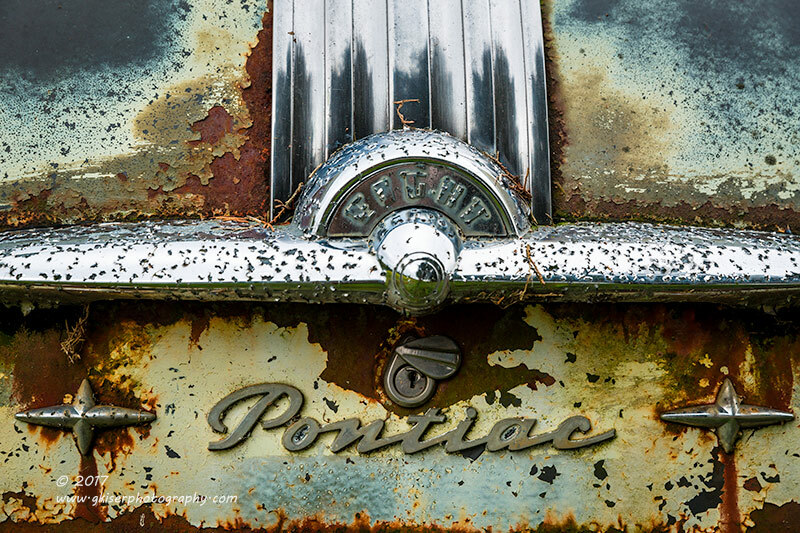 It was at that point that I remembered my favorite Pontiac that I have shot several times in the past. The problem with that Pontiac is that it sits in the shadows when the sun is out and the exposure on it is terrible to say the least. I have tried it several times with varying degrees of sunlight, but never under a totally cloudy sky before. This sky might actually prove very helpful for the car. I decided to slide by and give it a shot. The house that the car is parked next to has been vacant for some time, and there is a working farm to the side. Because of that, I am very careful not to disturb anything when I am shooting this car. There is nobody to ask permission of to shoot it, but the property is still used. Fortunately, the way to the car is easy enough. When I got there, I went straight for my 24-70mm lens which I knew was the best option for this car. I had a clothesline that was very close to it which always causes me problems, and forces me to get in close to the car. The clouds that were overhead were providing a perfect diffuser for the sun and for the first time ever, the exposure was actually very simple. The sky was dark enough that I didn't need any ND Grads, but I was going to use every bit of the exposure latitude in the camera. Fortunately, I wasn't going to need to do anything like HDR though. 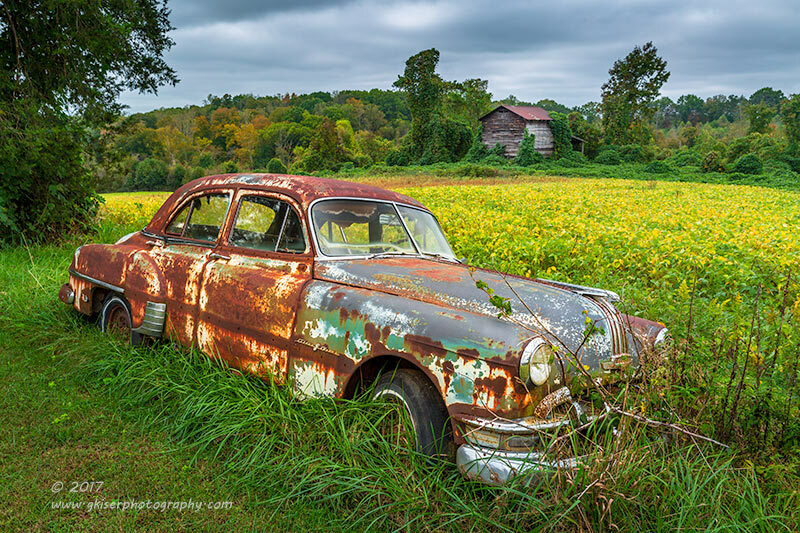 One of the best parts about this car is the barn that is situated across the field. Normally, the exposure puts the barn in the shadows, but today, lighting was nearly perfect. The barn showed up perfectly in the background and complimented the car quite well. The patina showed up better today than ever before. It made me wonder why I hadn't seriously considered shooting this car in the clouds before. This was the first car I ever shot emblems on, and it started something that has stuck with me for several years now. 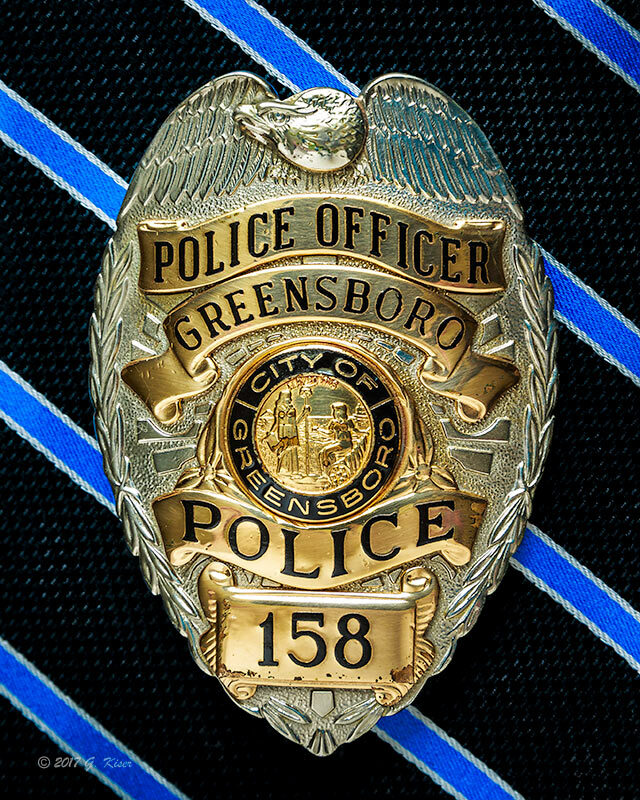 Because of that, I would be remiss if I didn't shoot the emblems on the car. I didn't want to do it the same way though, so I decided to keep the 24-70mm lens attached and used my depth of field options to my advantage with the hood. I'm really liking the dramatic composition of the winged Indian leaving the runway. I never would have tried that before, so chalk another one up to experimenting for this trip. The rear emblem also caught my eye. There were two stars that were added on to either side of the "Pontiac" script that made for natural bookends for a horizontal composition. The landing strip at the top was a nice counter to those stars and helped to bring the picture together since the horizontal bar cut the image in half. The patina was really nice on this car, even though it wasn't all that colorful. In keeping with my mantra of shoot it as I find it, I left the keyhole cover open. This actually worked out nicely as it took just enough of the symmetry away to add some visual tension and interest to the composition. I don't think I would have liked it as much with the cover closed. At this point, I had shot 140 frames in about 6 hours. I was getting tired and I needed to get home. Honestly, I was thinking that I had about five to seven images that I would find worthy of keeping. I wasn't all that confident in what I had captured. However, when I started the culling process, I quickly learned that I had done much better than I had originally thought. My experimenting worked wonders on this Trek, and that fact really came to light when Toni was looking at my 14 favorites. She was looking at Dabs of Color and said that it looked like my standard landscape and it would get lost in the mix. The insinuation was that the other ones were noticeably different from my normal shot and stood out from the crowd. I can live with that as a compliment. Have I had a week!!!! I had three different activations to work between Friday and Saturday. This counted for 22 hours worked starting Friday at 7:30pm and ending Sunday morning at 4:30am. My weekend consisted of a Sunday where I had to get ready to go back to work on Monday, and sleep to recover from a 14 hour night shift. Needless to say, the plan was not to go out for any pictures at all. Well, when I woke up around lunch time on Sunday, I started thinking about what I could do to recover from working so much. I figured a little bit of time in the mountains would be beneficial. The only problem was I didn't really have the time to commit to a mountain trek, and I knew that there would be gobs of people along the Parkway since this was peak weekend for most of the Blue Ridge. Instead, I decided that I would rather go somewhere a little closer to home where I could take advantage of the clouds and rainy weather. Hanging Rock was my go to, but I have been there a bunch recently. 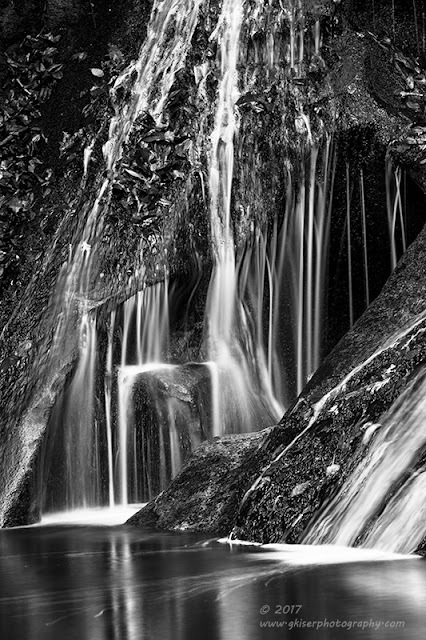 The next option was Stone Mountain where I hadn't been recently, and haven't seen Widow's Creek Falls since January. I was on the fence about going, so I asked Sierra if she wanted to go for a little hike in the mountains. She agreed, saying it beat sitting at home. She was right. When we arrived, we made the short hike to the waterfall and she started to set up her camera after finding a place kind of close to the falls. It had been some time since she had worked with the camera and took a little getting used to before things became natural for her again. While she was getting used to her camera once again, I started looking for a composition. The waterflow was very low so I wasn't all that interested in capturing the entire waterfall. There wasn't much color in the trees, so that made it natural to just skip that composition altogether. Instead, I started working on isolating what excited me about the waterfall. That was the section at the bottom left which had some very interesting voids in the rock that made for great cascades. I fitted my 70-200mm lens and added a Singh Ray Polarizer to reduce the glare. That combination, along with the light was giving me between eight and ten seconds worth of exposure. That worked out great for the speed of the water. I started to work my composition and found that I was able to get in pretty close to the waterfall and frame a tight shot of the area. I've done a composition similar to this before, but it was void of color due to the lighting and lack of freshly fallen leaves. My intention was to really accentuate the Autumn hues in this, so I got the camera at a height that would give me the best reflection in the water. I set the white balance to give everything a warm glow, and fired the shutter. I was pretty happy with how it turned out in the LCD, but I wasn't sure how the colors would look since I was looking at a desaturated, low contrast RAW capture in the LCD. It wasn't until I got home and processed it in Lightroom that I was able to see that I captured just what I was after. While Sierra was still working on some different compositions, I started to pick out other areas that I wanted to photograph. One of these areas was the woodland on the other side of the pool. I still had my long lens attached, and I needed it for the composition that I was after. I went with a full 200mm focal length and composed an image around two trees that stood out from the rest. The idea with this image was to capture a scene that was pretty representative of the woods in North Carolina. For the most part they are not all that orderly, and there is a lot of different types of plants just growing randomly. 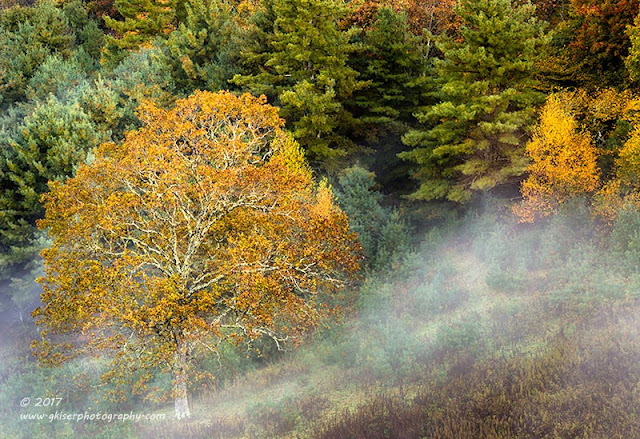 Having the stark trees as an anchor helps to provide a little bit of order to the chaotic scene that I captured. I would have loved for there to be some Fall colors here, but I'm pretty happy with the different shades of green as they are not long for this world. There was a tad of orange to the right that helped to set the time of year for this image. It wasn't long before Sierra was done and packing up her gear. She was not quite finished, however, and wanted to do some more hiking. Well, I knew of a nice little trail nearby that lead to an old chimney in the woods that I thought she would have fun with. The hike was not quite a mile by my estimate, but it was pretty steep so she wasn't too happy with me. We did find the old chimney, but it wasn't all that great in my eyes this time. Sierra had fun working it though. While she was doing her thing, I started looking at the trees, and found a pretty cool design in one of them back toward the trail. I got the camera back out and left the 70-200mm lens on as well as the polarizer. 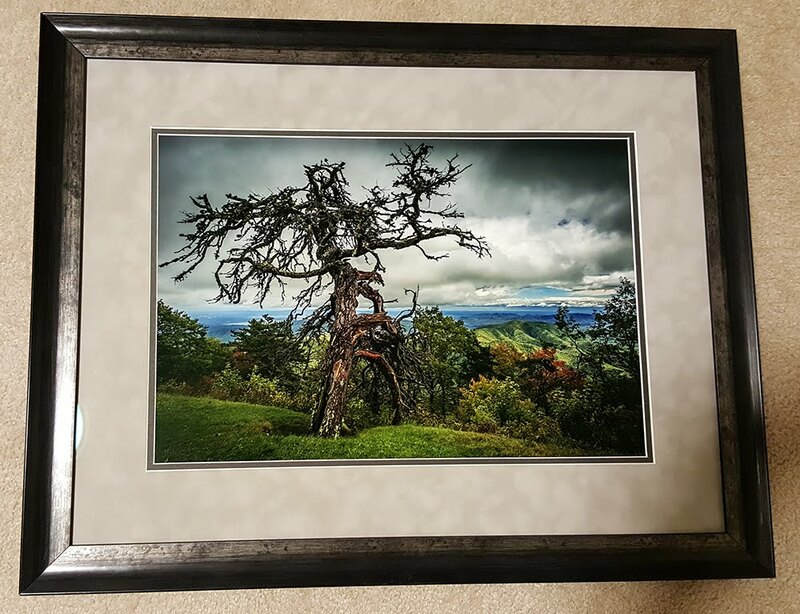 I started to frame the scene up and found that the branches of the tree fit the 4x6 ratio almost perfectly. I worked out the exposure and shot the scene. What I really liked about this scene was that you could see some of the early Fall colors starting to appear as yellows and golds. There was also another tree in the distance that stood out and happened to be framed by the tree that I was shooting. From a compositional aspect, this was going very well. There was a slight backlight to the leaves, but it was faint due to the clouds. In fact, there was a little bit of drizzle falling at the time I shot this image. I tried to work the old chimney, but I just couldn't get anything that I really liked. The one tree was what I got excited about, and what I decided would be the representation of that location. Sierra got several different pictures of the chimney, and started to learn a little about isolating elements using a long focal length. She didn't fully grasp the idea until she saw my interpretation of the scene and the light bulb clicked on. I'm sure that she will incorporate this into her next trek. 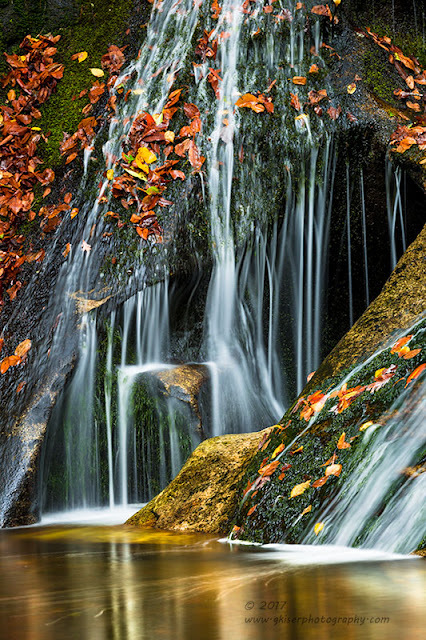 When I got home and started to process the pictures from the day, I was exceedingly happy with the intimate portrait of Widow's Creek Falls, and loved the textures, and the contrast as much as I liked the colors in the composition. I was pretty sure that the scene would stand on its own without the colors after processing it. To be honest, I had also envisioned it as a black and white when I had originally shot it. The color was just too good to overlook, but now that I was home, I could do the conversion and see what I had. I started the conversion and immediately saw the potential. I tweaked the tonal values to add a bunch more contrast to the scene and found that the monochrome version was pretty cool! The total feel of the image changed, and the original title no longer fit this image. Because this image was so far and away different, I decided (as I rarely will) to give this conversion a different title. I think that it deserves it due to the differences between the moods. I'm not sure which I like better, but both of them represent the strongest images from the day. I shot 38 frames while I was at Stone Mountain (Sierra shot 37), and ended up coming home with these four keepers. I'm very happy about that since I wasn't even going to go out today. I got my rest and recovery from the weekend while recharging in the mountains, and spending time with my daughter. Can't go wrong with that plan no matter how you look at it. Autumn Peak is scheduled for a week away along the Blue Ridge Parkway. That should mean that the leaves are really starting to get in full swing by this point. In the moderate elevations of the Parkway, I was expecting that the leaves were getting pretty close to peak as they typically change about a week ahead of the lower (primary) sections of the Parkway. I was lucky enough to have accumulated enough hours at work that I could bug out a little early on Friday, which I did. That gave me just enough time to get up to the mountains for about two hours worth of daylight before sunset. My plan was to work around the area of Rough Ridge which is right at Grandfather Mountain and by my calculations should be quite colorful at this point. I must admit, it was a different animal entirely going to the mountains in the daylight, and in traffic. I was used to going hours before sunrise and knew the darkness around the highway like the back of my hand. Driving the daytime did have its benefits. I could see the clouds that had been hanging around all day which were going to be wonderful in my photographs. Between the dramatic skies and the colors on the trees, I should be having a very successful trek ahead of me. By the time I hit Wilkesboro, my mood changed a little bit though. The clouds that I had been looking at all day long were starting to thin out and and it looked like by the time I got to the mountains they would all be gone. The cloud forecast was calling for 70% coverage, but I was thinking that they missed the mark completely. 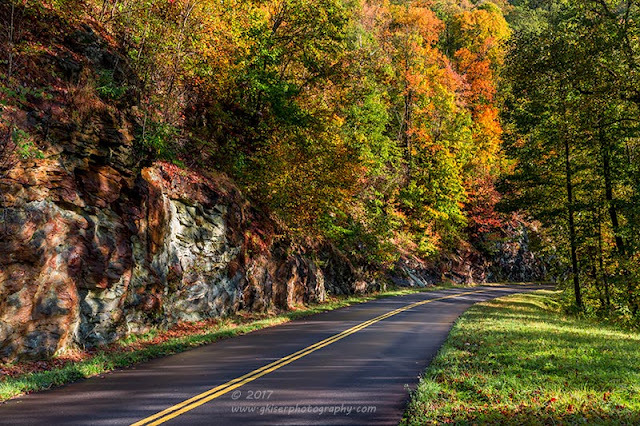 Oh well, I was nearly to the Blue Ridge Parkway and I wanted to continue if for no other reason than to see the leaves at Grandfather Mountain. 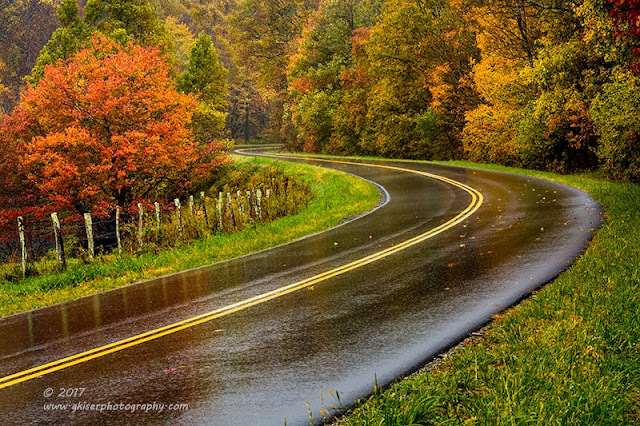 When I arrived at the Parkway, the leaves were barely even showing a change. This wasn't what I expected at all. I knew that Rough Ridge was still up about 1000 feet or so, which gave me hope, but the closer I got the more my hopes dwindled. By the time I got to Price Park and saw the same conditions I had a week ago, I wasn't holding out much hope for autumn colors. The clouds had all but gone as well. Was I looking at a wasted trip to the mountains? I sure wasn't seeing much that I wanted to photograph. When I got to Rough Ridge, there was no parking available in the parking lot, and there were even cars parked on the side of the Parkway. Yeah, I could pull over to the side of the road, but the leaves weren't all that great at all. Not good enough for me to fight the crowds anyway. 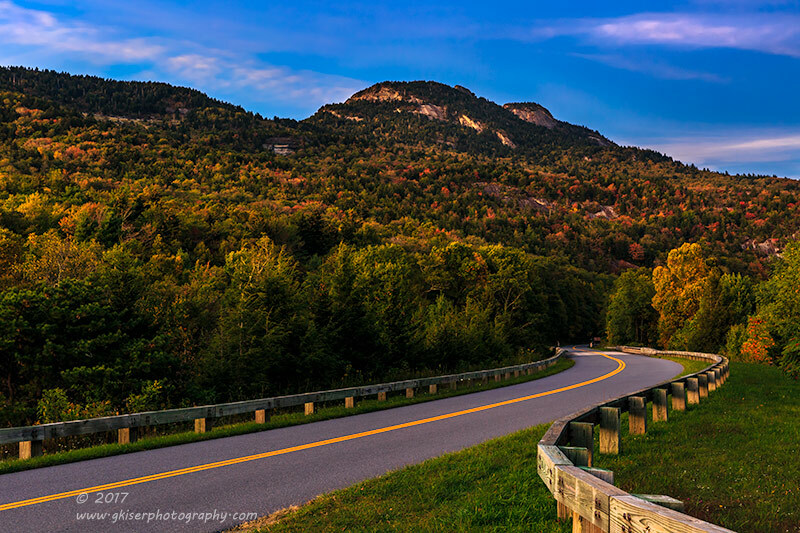 I thought that I would head down the road to see if the colors were better around the Viaduct because I knew of a couple of compositions that could be made from Rough Ridge that included that section of the mountain. When I got there, I wasn't happy with the colors at all. Things were just not looking Autumn enough. The roadway was crowded, and it was just not going well at all. I pulled into one of the first overlooks after the Viaduct to collect my thoughts. It happened to be Beacon Heights which gave a view of Rough Ridge. I looked at the mountain and could see some very patchy color from this side. Since there was only about an hour or so until the golden hour, I decided to stop here and see what I could do. I also knew that there were some hiking trails off of the overlook which I had never been on before. I started out with working on the Rough Ridge area using the Parkway as some foreground interest. The lighting was nothing really special, but at least there were some clouds in the frame. I got about four frames here, but wasn't happy with any of them Just too run of the mill for my tastes. I packed the camera up and started down the hiking trails. The hike was relatively short and fairly easy to accomplish. I started out with the right fork in the trail and came out on a rocky bald. There were already several people standing and sitting here. There was a pretty good view, but the light was not right, and there were more people than I cared to deal with. Since I still had a bit of time, I moved back onto the trail and took the other fork. That took me to a different bald, but with a similar view, just more to the left. There was more options of foregrounds here, and even more important I could see the Rough Ridge from this section. There was a nice tree that I could use as a foreground interest as well. I pulled out the camera once again and started to work some compositions. The problem was that the distant mountain was under full sunlight, and the foreground that I was wanting to use was in the shadows. I had to use ND Grads to keep the sky under control, and was still not able to get the exposure the way I really wanted it. I had now shot about 25 frames and had yet to get something that I really thought would work out. I was really starting to get discouraged. To make matters worse, my silence was interrupted by the wedding party that finally joined me. It wasn't a wedding, but a wedding photo shoot with the bride. Well, now in the background I was listening to modeling instructions and a young boy who was very tired and whiny. My zen was shaken and I wasn't liking anything that I was working with. I intended to swap lenses, but my hands started to put away my camera. Well, that might have been a subconscious sign, so I went with it and packed everything away. There was now about 30 minutes before sunset, and not enough time to go anywhere else. I decided to take my chances with the larger number of people on the other bald. When I got there, there were more people. They were sitting, standing, walking, and just generally....there. The change of getting much in the way of a foreground was slim. It was also in the shade, so it wouldn't really work all that great anyway. Because of that I went ahead and fitted my 70-200mm lens, and left the front element bare with the exception of the lens hood to keep any sunlight leaks from causing any ghosting. I started to pick out sections of the range in front of me to photograph. There was a lot of interesting sections, but they were lacking in context for the most part. Almost on a whim, I decided that I would try a panorama to capture the entire scene. My main reason for this was the way the light was playing with the mountains. On one side, I was seeing a warm glow from the setting sun, while the other side was in the shadows presenting a very cool color tone. This was a striking balance between color pallets. There was really no other way than a panorama to capture this. I flipped the camera on its end, and racked it out to 70mm. I leveled the tripod, and did a dry run to check that the camera would remain level through the sweep. I picked my end points, and then found the focus length. it was then time to confirm that the exposure would be right. I dialed it in on the right side which was the brightest. I checked the left, which was mostly in the dark. That seemed like it would be correct. I swept through the seven frames quickly sine the light was changing very fast with the setting sun. When it was all over, the light had changed, and I was hoping that I had something that would work. It wasn't until I started to edit the next day that I found out that not only did the sequence work, it also turned into my favorite image from the day! Shortly after shooting the panorama, the crowds started to leave. Unfortunately, it was not in time for me to compose shots that would include any type of foreground interest. It was just too dark at this point. I went ahead and packed the camera up and started my way back down the trail. Right before hitting the parking lot I found an interesting tree trunk that I wanted to try an intimate portrait of. The lighting was so dim at this point I had to bring out the flashlight in order to get a little color in the trunk. This never really did pan out photographically though. I was pretty sure that I was done for the evening at this point, so I finished the hike to the truck. I could see that the sky was still kind of light above the Rough Ridge, and there were a couple of faint clouds above the mountain. I decided that it would be worth trying that subject once again. I pulled the camera back out and added the 24-70mm lens. I used no filters since it was getting dark and the exposure was pretty much even across the scene. What I was liking about this scene was that the colors were different than I normally see them. You could see the fall colors on the side of the mountain, but they just looked different. I set the camera up using the railing and the road as a leading line, and dialed in a five second exposure. The longest part was waiting for the traffic to stop long enough to shoot the shot. What you are seeing here was created just after a motorcycle road out of the distance, and a car had passed me by to the left. There was the sound of another car coming from behind me that appeared just as the shot finished exposing. The light became too dark to repeat the exposure the next time I had a clear patch of road. I though about adding light trails, but I wasn't able to get the exposure that long without doing some changes to my setup that I didn't have time for. Plus, I kind of liked the calm effect of the composition that I had created. With the light pretty much gone, I packed everything up and started the two hour trip back home. Obviously, I didn't get the pictures processed that night. I wanted until the next evening to start the processing, which ran into Sunday morning. Out of 80-some frames, I ended up only keeping four of them. That is less than a 5% cut, but considering the difficulties I was having finding something that I liked, I can live with those four images. It wasn't an earth shattering trek by any stretch, but I found a new place to play with, and I got to see another segment of this fall season.